An ideal giveaway for the medical marijuana industry! This custom printed promotional Cannabis Scented Twist Pen is made in the USA and comes imprinted with your logo and company information on lower barrel. 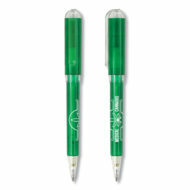 A great way to “build” your brand, this cannabis-scented pen will make a big impact! One Color Imprint on Barrel Included! Looking for a unique item to market your brand with? We can help! 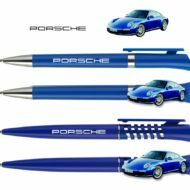 We inspire and create custom clip pens with full-color imprint! Due to this product being completely custom, we ask that you please contact us for a quote! Our prices include pen, custom clip mold, artwork setup, full-color digital imprint on clip and shipping to 1 location in the USA. Please request a quote! 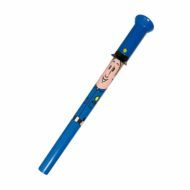 Policeman pen features an oversized body for a better grip and a sturdy base to hold the cap firmly on either end. Need it Faster? Rush Production Available – Please Contact Us for Assistance! A great novelty item for Breast Cancer Awareness campaigns and much more, our Pink Lady Smilez Pen is bound to make a lasting impression! 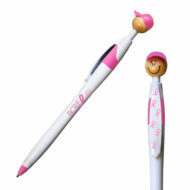 This click-action pen features pink trim, cap and ribbon imprints on clip. Need it Faster? Free 24-Hour Production Available – Contact Us! A great novelty item for auto body shops, HVAC, plumbing, trucking, landscaping, manufacturing and more! 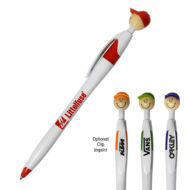 Our Cappy Smilez Pen features a colorful cap and matching trim. Available with black ink only.